The IRRI Rice Knowledge Bank [RKB] is the central repository for all IRRI’s research-based rice science and rice farming knowledge that is relevant to the extension-farmer community. The IRRI RKB is also the model for similar RKBs in each partner country where the individual countries select, validate and modify rice farming knowledge for their extension/farmer communities. The strength of the RKB community depends on developing a shared vision for the RKBs, a sharing of knowledge and exchanging information about technical issues. Recently the RKB has undergone a significant revision in its form and much effort is now being expended in updating the content. 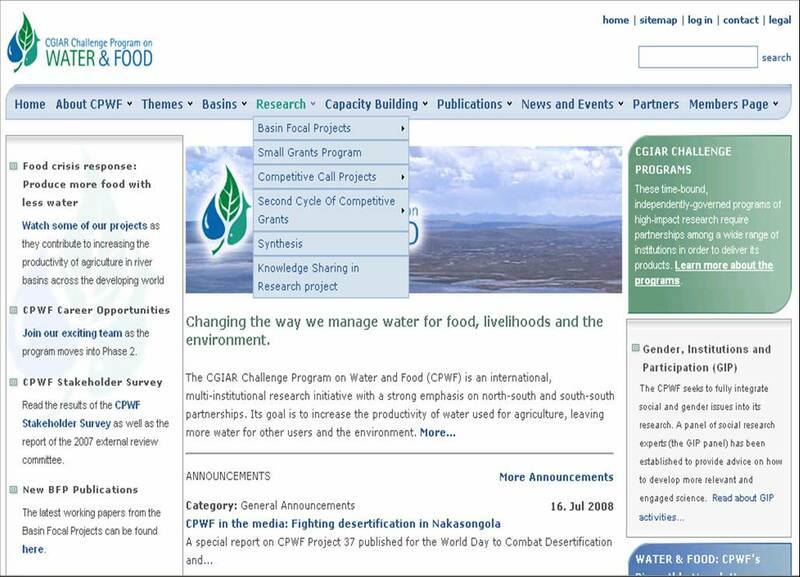 The new form for all content will be Joomla-based, an open source software platform that is inexpensive and easy for partner countries to use for modification of IRRI content. In addition, some new features are being considered in the form of ‘expert systems’ – the very popular Rice Doctor will be upgraded to link to other content within the RKB, and ‘expert systems’ for farm machinery purchase will be added. This is an opportune time to gain in-depth advice from IRRI’s RKB constituency and to build an institutional understanding of the challenges in managing up to date knowledge for extension. This will also strengthen the longer term linkage between NAFRI and IRRI in the processes of knowledge management for rice and build stronger two way communication. As part of its Knowledge Sharing in Research Pilot project, IRRI has invited and funded a 1 month on-the-job traineeship for a person from the Laos Ministry of Agriculture to work within the RKB technical team on re-structuring an adding extra features to the RKB. (1) Review of the Joomla directions from the point of view of in-country partners and provide advice as to its suitability. (2) Assisting in the conversion of electronic books and e-learning products to the new format and advise on their appropriateness. (3) Creating a PowerPoint presentation showing a wide range of fact sheet formats. (4) Creating a set of instructions for in-country partners regarding the conversion of IRRI content to local form and languages. (5) Advising on how to address the issue of ‘facilitated learning’ conducted by in-country partners based on the IRRI e-learning courses. (6) Assisting in the technical re-design of the Rice Doctor and the implantation of other ‘expert system’ modules. In addition, the on-the-job-training activity will create a model of closer technical cooperation between IRRI RKB and its in-country partners which will be necessary in the move to greater exchange of knowledge between countries. The person chosen for the on-the-job-training was Virachith. He has just completed his one month and we hope to share some of his experiences and lessons in future blog posts. According to Noel Magor, Head of training at IRRI, “Virachith had a very productive time here and so I was more than happy that we had taken the steps to bring him here within the time of the KSinR Pilot project”. 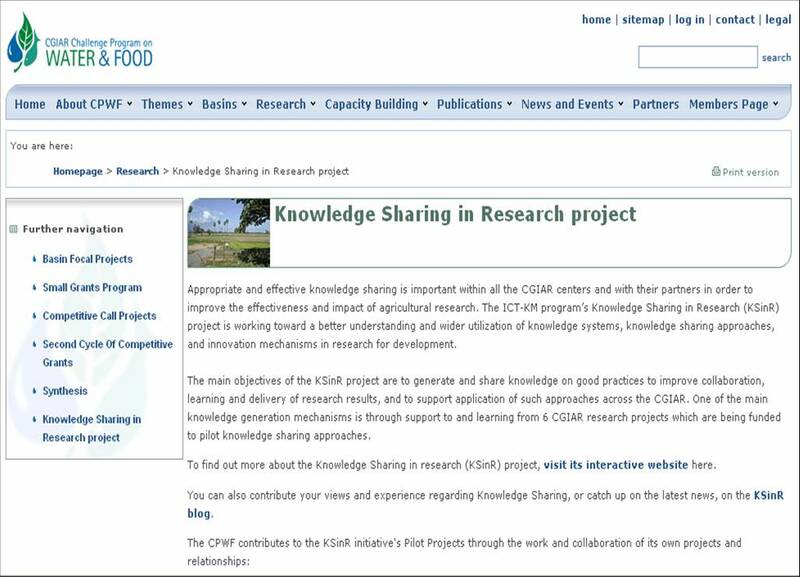 The Knowledge Sharing project-both Phase I and II- have enjoyed great support from the CPWF, which itself adopts many principles and frameworks of knowledge sharing in research. One of the activities proposed by the IWMI Wastewater KSinR Pilot project was the development of an interactive radio program to extend the delivery of research results and messages to target groups. The radio program was targeted at farmers, traders (market women) and caterers-all users of wastewater in various stages of food production. A script for the radio program was first developed by deriving key messages from results of various research projects working on wastewater issues in Ghana. Once the key messages to be broadcast were developed, these were translated into Dagbani, a local language in Ghana. This interactive radio broadcasting on wastewater use messages was recently held on 14th and 20th June 2008. As this is a new approach of dissemination for many research organisations, it is interesting to look at the challenges that may occur as well. Gordana explained that “The problem we found is that everyone talks too much, it was difficult confining them to a 1 hour frame“. Dr. Pay Dreschel, IWMI researcher and Theme Leader in the Ghana office who oversees the wastewater work and champions the KS efforts within it, responded to this time issue saying “this type of chaos is often inevitable and can be reduced by developing before-hand a clear discussion line for the program“. This radio program has been recorded and will be shared with others who may be able to use the program itself or learn from this experience for undertaking their own radio programs. To follow-up on this activity in order to learn from the use of this type of strategy and see whether the messages were received, remembered and used, interviews with listeners will be carried out. According to Pay “it will be interesting to get the listener feedback. Doing this some weeks later will have merit in terms of seeing if there is any longer-term memory or behaviour change impact from the radio program“.